Coverage up to 1,000 cu. ft.
Coverage up to 1,800 cu. ft.
Coverage from 600 cu. ft. to 4,000 cu. 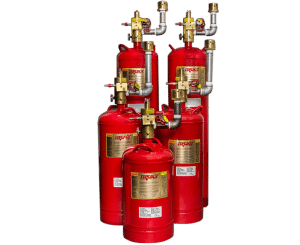 ft.
Fireboy clean agent fire extinguisher systems are designed to automatically discharge whenever the protected space ambient temperature reaches 175 degrees Fahrenheit. When the Fireboy System discharges, the extinguisher is designed to fully empty the contents in less than 10 seconds. No clean up is required. There is no powdery residue or water left behind. The fire is extinguished by a combination of heat reduction and chemical reaction. Fireboy Systems are available to protect engine rooms and machinery spaces from as small as 25 cubic feet to as large as 3000 cubic feet. Each Fireboy pre-engineered fire extinguishing system includes stainless steel mounting brackets, helm station status LED panel and Owners/Installation manual. Backed by our 3-year limited warranty. All Fireboy Extinguishers are factory refillable except when the discharge is the result of a fire. All systems meet EN ISO 9094-1 and EN ISO 9094-2 standards.